MUVE-along Show 03/28/11 (abridged). Norma loves Salsa, and she is here today to show us how easy it is to groove to the hot Latin rhythms of her favorite band Son Caribe. She gives us the very basic low-down on Salsa dancing, what to do and what to avoid. "It's a personal relationship between you and the music," she says. Salsa connects many cultures and people from many walks of live. She demonstrates the basic steps and soon Maggie and Norma are enjoying easy Salsa dance grooves. As always the goal is to inspire the audience (you) to get up and dance along in front of their television (your computer). Staying motivated to exercise is easy when you are having so much fun. Anyone can do this joyful dance. These moves are great dance exercises for elderly people, middle-aged people, teenagers, school and little kids. Everyone can MUVE with us at their own pace. Check out the MUVE Video Blog https://muve.org/blog/ and dance along for free any time of the day! 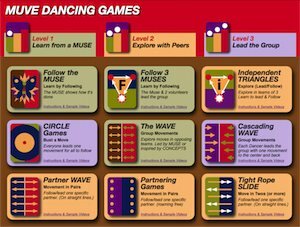 The MUVE Along Dance Exercise Show airs in Honolulu, Hawaii every Monday at 8 AM on Television Channel OC16 and is streaming live on the internet at www.oc16.tv. Each week Maggie brings new guests to inspire the audience to join in for some easy cardio exercises in their living room.